This project will analyze molecular mechanism of vascular damage in hypertension. To this end we analyze the role of receptor signalling via G-protein-coupled receptors (GPCRs) and steroid receptors in the vasculature using genetically modified mouse models. Normal cardiovascular development and physiology depend in part upon signaling through GPCRs, such as angiotensin II type 1 receptors, sphingosine 1-phosphate receptors, and endothelin-1 receptors. RGS (regulator of G protein signaling) proteins are GTPase regulating proteins that attenuate signalling via heterometric G-proteins. Impairment of RGS2 expression may promote the development of hypertension. Therefore, the pathophysiological role of this protein requires further investigation. In addition to GPCRs, mineralcorticoids and the mineralcorticoid receptor (MR) are involved in the blood pressure regulation. The function of MR in different cells and tissues of the mouse are investigated using Cre/loxP technology. A third project studies the molecular pathways of abdominal aortic aneurysm formation, which is a common vascular disorder frequently associated with long-term history of hypertension. This study is focused on the role of the kallikerein-kinin- and renin-angiotensin systems in vascular remodelling. Systemic hemodynamics in RGS2-deficient mice: The role of G-Protein coupled receptors for short and long-term blood pressure regulation and cardiovascular endorgan damage. pressure regulation in the face of RGS2 deficiency. We tested autonomic nervous system function and blood pressure regulation in RGS2-deficient mice (RGS2-/-). We measured arterial blood pressure and heart rate with telemetry, computed time and frequency-domain measures for blood pressure and heart rate variability (HRV) as well as baroreflex sensitivity (BRS-LF), assessed environmental stress sensitivity, and measured urinary catecholamine excretion. We conclude that RGS2 deletion increases sympathetic tone, stress sensitivity and leads to a baroreceptor-heart rate reflex resetting, while baroreflex sensitivity remains unimpaired. Mineralocorticoids and the mineralocorticoud receptor (MR) are known to be involved in blood pressure regulation. We showed recently that aldosterone potentiates angiotensin (Ang) II-induced MAP kinase activation (Mazak et al. 2004). Interestingly, the Ang II-induced ERK ½ phoshorylation was blocked by the MR blocker spironolactone (Spi; Fig. 3). To analyze the function of the MR in vascular smooth muscle cells, we started to analyze blood pressure in VSMC-specific mutants, and to measure the vascular response to aldosterone. 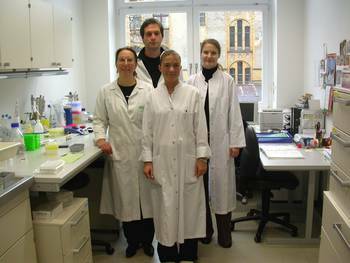 These analyses are performed in collaboration with Prof. F. Luft in Berlin. In order to obtain a better understanding of the role of steroid hormone receptors in vascular function, we combine two important strategies and procedures, which we have developed in our lab: highly specific gene ablation using the Cre-loxP system (Fig. 4) and BAC transgenics, and gene expression profiling using amplification of nanogram amounts of RNA. Molecular pathways of abdominal aortic aneurysm formation. The kallikrein-kinin- and renin-angiotensin systems are known to play an important role in the hemodynamic stress, which has been identified as a causative factor for aneurysm formation. Recently, comparing Brown Norway (BN) rats with genetically kininogen deficient Brown Norway Katholik (BN/Ka) rats, we have shown that kininogen deficiency promotes the formation of aneurysms of the abdominal aorta, but does not promote atherosclerosis (Kaschina et al., 2004). (Fig.5). We have examined tissues from human abdominal aortic aneurysm and found an activation of matrix metalloproteases, cystein proteases, and components of the renin-angiotensin system (cathepsin D, chymase, AT1 receptor) as well as down-regulation of the anti-proteolytic mediators (TIMP-4 and high molecular weight kininogen). Using primary cell cultures (VSMC, EC), we could also demonstrate that two chain high molecular weight kininogen decreases MMP-2 expression induced by interleukin-1alpha in VSMC and prevents apoptosis. Further investigation of the main intracellular intracellular signalling cascades will be performed via cell transfection array (TSA) in cooperation with MPG-MG (M.Janitz). To evaluate the essential process underlying aortic remodeling we examined protein expression profiles of the aneurysmal tissue from patients undergoing surgery in comparison to atherosclerotic aortic tissue (in cooperation with RZPD, C. Maercker). Based on the results of our experiments, new therapeutic strategies will be applied to rats. The overall goal of this subproject is to obtain new insights into the genomics of vascular tone regulation and vascular remodeling in hypertension. Increases in vascular tone and vascular damage are major factors for the progression of hypertension and target organ disease, particularly stroke and coronary heart disease. Here we specifically provided animal models as a resource for other network members to characterize and validate candidate genes in vascular disease.